The foundation is the inspiration of one mother’s efforts to help another. When Kate Winslet narrated A Mother’s Courage: Talking Back to Autism, a documentary about a young Icelandic boy named Keli Thorsteinsson living with autism, the Oscar-winning actress and mother of two became inspired to make a difference. Autism is a complex condition, but the mission of the Golden Hat Foundation is simple: improve the lives of people with autism around the world. As Lancôme ambassador, Kate Winslet teamed-up with the cosmetic brand to create a special three-product line to benefit her new Golden Hat Foundation. A new project to attract attention to the foundation and autism, is a book. 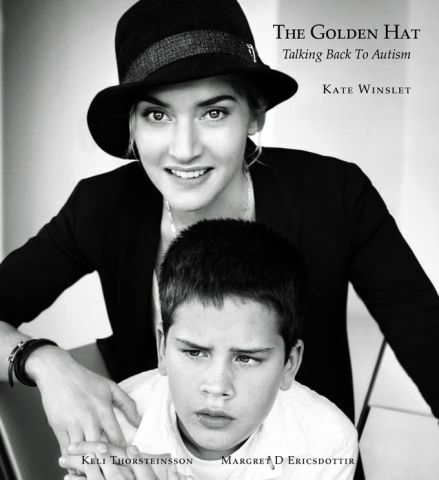 Kate Winslet’s, The Golden Hat: Talking Back to Autism, is a special project from the Academy Award-winning actress–a collection of one hundred stunning self-portraits from A-list celebrities and cultural luminaries, all wearing her “golden” hat to support autism outreach and research. The book is now available in stores and online via Amazon. Do you want to support the foundation? This entry was posted in & Other Things and tagged Golden Hat Foundation, Kate Winslet, Lancome. by sofischoice. Bookmark the permalink.